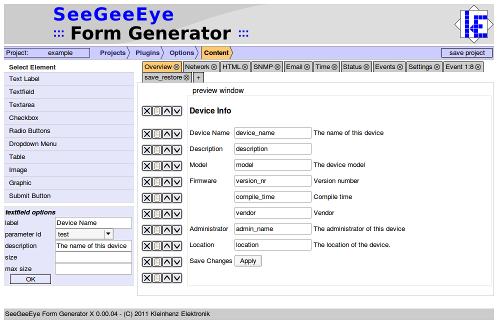 SeeGeeEye (SGE2, the second version) is a programming framework for building web front ends for embedded devices. It includes all the tools for producing a sophisticated GUI with different requirements, designing the pages, creating menus, assigning a template (CSS style sheet) to it, and interfacing with the hardware or another application. On the embedded system, there is also web server integrated. Presently SeeGeeEye runs under Linux 2.4 and 2.6 on ARM, X86, PowerPC, MIPS processors. It is prepared to be ported to real embedded systems without a standard operating system. A demo version is also available for Windows. With this it can easily be integrated in an existing environment. Any modern browser can display the HTML pages and interact with SGE2. With its plug-in system, new interfaces or protocols can be added. For process control, a OPC server can integrated. SGE2 comes with a revolutionary concept: SGE2 supplies a preconfigured, ready to use application, and tools to adopt it the needs of the new design. So it is very easy to get good results in a very short time. Design phase can be heavily reduce due to its easy way of working. The first results can be achieved within a few hours of implementation. The run time system is fast. It is completely written in C and C++. No interpretation language is used like php, JAVA, or ruby. Additionally the integrated web server is optimized for SGE2 requirements. Front end design (GUI) and application development can be separated. All experts can work in parallel, independent and very efficient. The GUI specialist will take care for the presentation and usability, while the software engineer programs the application. The hardware developer can make his design in parallel, because SGE2 can work without any hardware. Many standard feature are available as modules( like event handling, logging, scheduling, communications, graphics, ... and many more) for SGE2, and need not be programmed. They are fully tested, optimized for SGE2, and can integrated with a few mouse clicks. Ask for the latest list of available modules. SGE2 can be used in many areas. SGE2 can be ported to many operating systems and platforms, and can also be used in real embedded system without an OS. SGE2 can be used for small ( up to a few hundred data points) and very large systems (more than 10 000 data points). It is even possible to split the functionality over several computers. This makes SGE2 the best choice for small AND large systems. What applications can be build with SGE2? SGE2 is designed to build any web based embedded systems. The range of application can also be described by remote control, maintenance, inventory, concentrator, VOIP telephones, gateways, protocol converter, measurement instruments. All the apps have in common, that they are accessed over a network with a modern web browser. How to design the user interface(GUI) with SGE2? The designers are the major tools and an important part of SGE2. To fulfil the different requirement of the to designed application, so there are three different editors available to build the front end (GUI) of SGE2. With a few clicks in the SGE2 Form generator a new HTML page is build. Even complex forms can be done without any HTML knowledge. It support standard HTML elements, like text input, text area, drop down box, radio buttons, check boxes ... and many predefined types like select boxes for date or country. For each line a label, a description, and a help button can be assigned. Tables with different options, real time graphs and diagrams (in pseudo graphic; for real graphics see below) provide a good overview for the data. The menu generator arranges the designed pages in the desired order and links all pages together. There are vertical and horizontal menus possible. Predefined and user changeable CSS style sheets are used to give it an individual appearance. It also knows the standard HTML elements, but they can be located anywhere on the document. 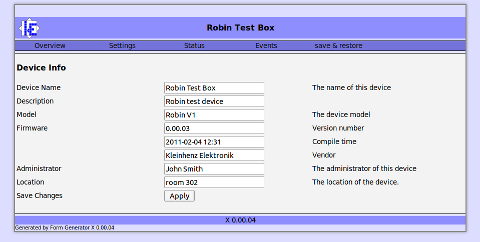 Registers are supported, to have compact design. The full graphical designer is the right tool for all process visualisation. Through the use of SVG, it is open to integrate graphic data from other programs. All designers are web based and can be used with all operating systems. Additionally SGE2 designer is a JAVA app and can run stand alone on all operating systems with JAVA support (Windows XP, Vista, 7; MacOS, Linux). The output (HTML pages and SVG files) can even be combined within a single project. This is achieved by the use of the same communication protocol with the web server. The SGE2 framework has a very powerful alarm system. Any dangerous status can be reported to the operator(s). It sends multiple messages over several communication channel like SMNP trap, syslog message, email, and SMS. If the alarm condition goes away, another messages can be sent. An internal log file keeps track of alarms. It is used for automatically repeated procedures, on a fixed time, or periodically from seconds to hours, or on daily, weekly, monthly, or yearly basis. Each main event may have a number of exceptions, so that for example the maintenance will not be done on Sundays or during holidays. Each time event can be combine with the alarm system.